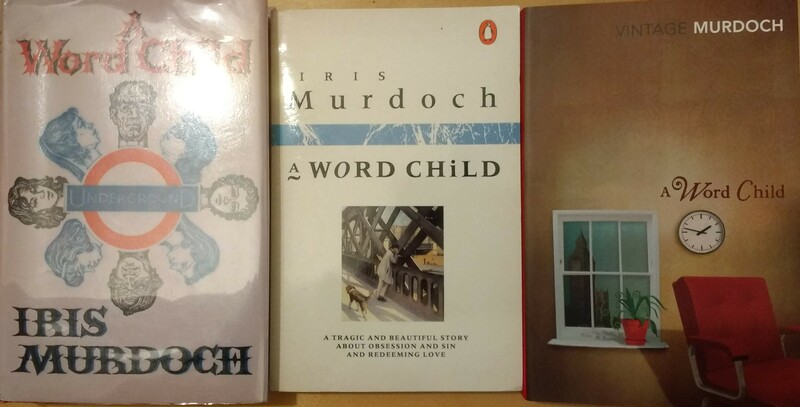 It’s the end of the month so time to round up where our general thoughts went on “A Word Child” and look forward to April’s read, “Henry and Cato”. 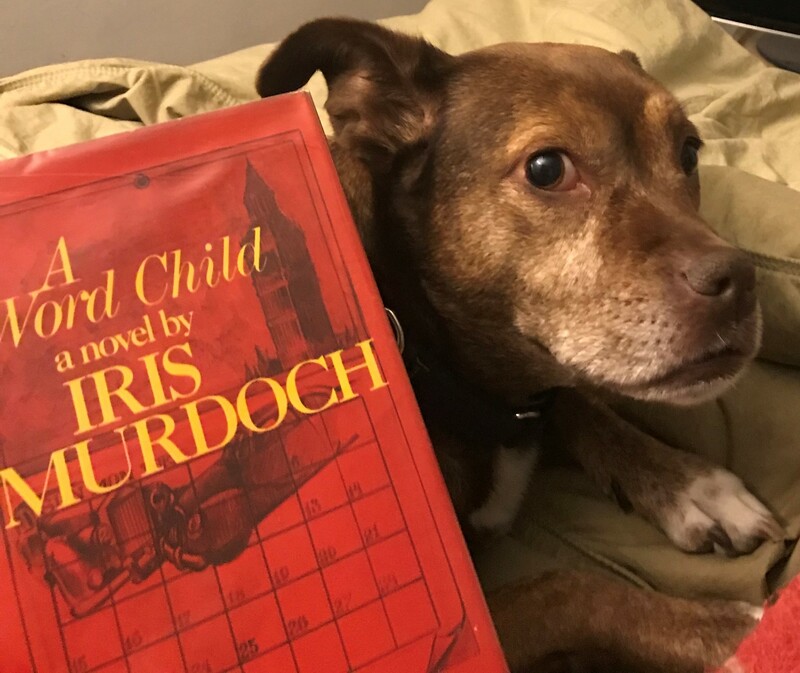 We had a good discussion about “A Word Child” on my review, with some of us, including me, shocked that I’d found Hilary a positive character: not this time! Jo did another great review on Goodreads and as usual I will add any other blog reviews you tell me about to this page. Do pop your comments on the review post even if you’re coming to this a bit late – I’d love this project to live on and be something people decide to undertake in the future! and a back that tells the whole plot! Finally, here’s Peter’s dog Lexie helping him read it: how lovely! 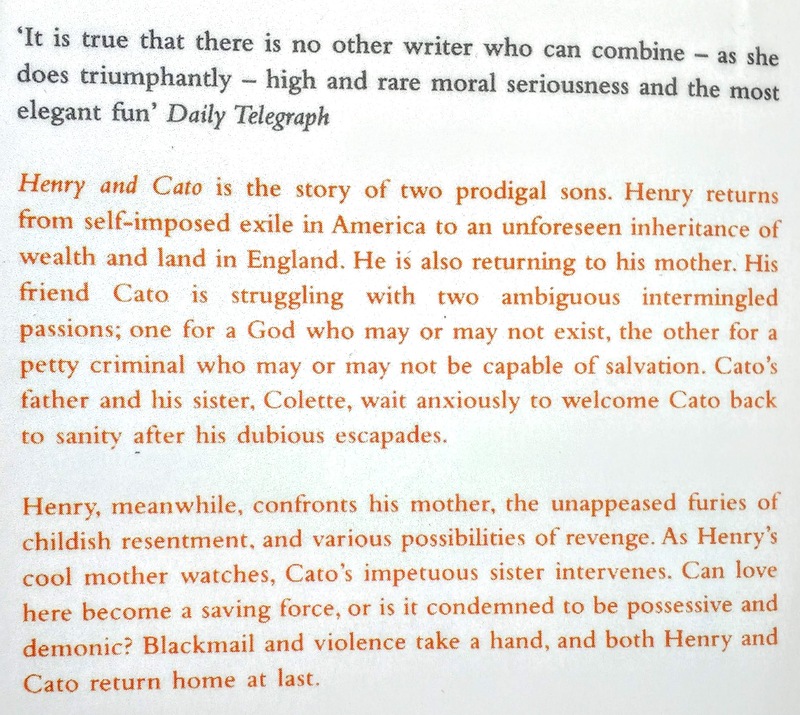 So, on to Henry and Cato. I have three copies, the 1st edition, a Triad Granada published in 1977, my reprint being the 1986 one (so bought and read when I was 14 or a bit older) and then the older-style Vintage one because this is another that doesn’t have the red cover. I have to say I do dislike the Triad cover! 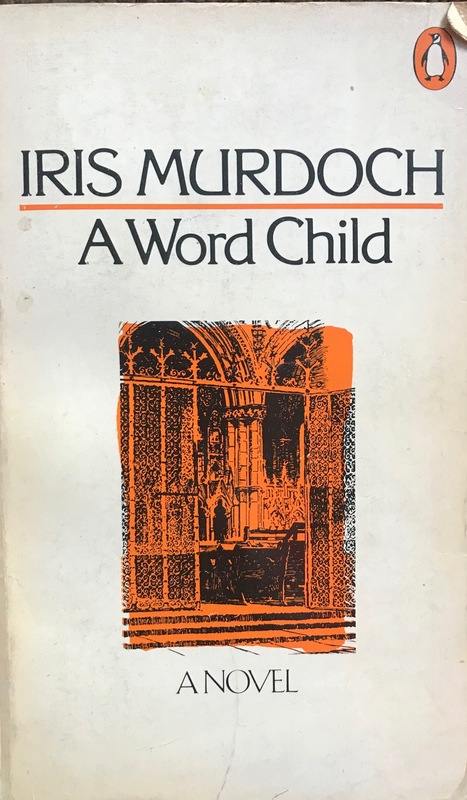 The first edition I bought in Oxfam (they hadn’t realised it was a first, I got it for £2.49 and I went back and gave them an extra donation when I’d checked it). 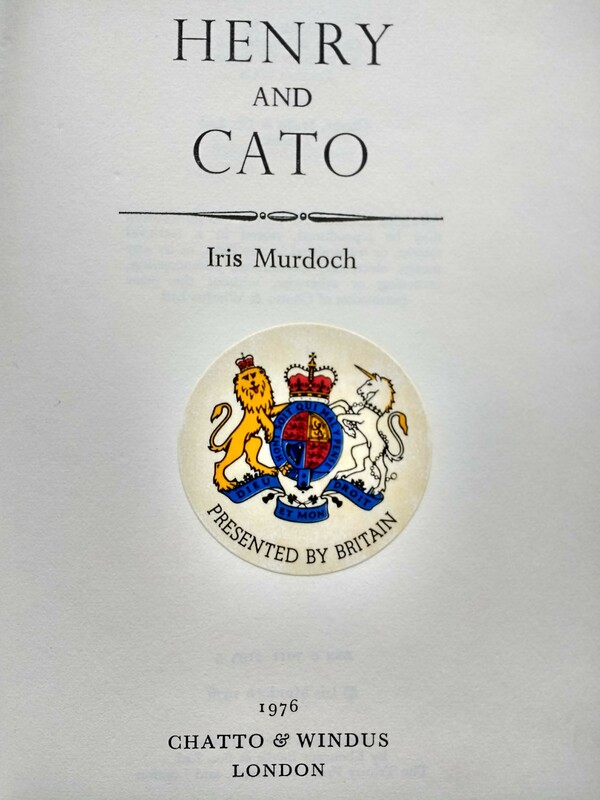 It also has a mysterious sticker on the title page: a diplomatic gift, I think. No notion of who “Britain” presented it to, however. 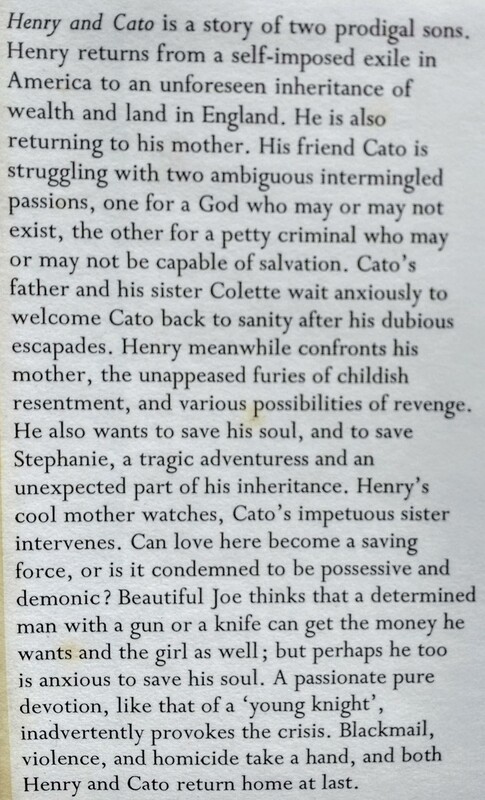 Are you going to be reading or re-reading “Henry and Cato” along with me? Are you catching up with the others or have you given up? What’s your favourite so far? Your least favourite? (and why has no one answered that question yet?). Do you have a photo to share of you reading one of the books, or where you read it? 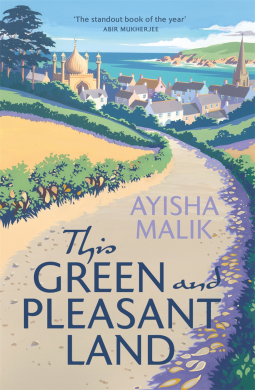 This lovely novel was written by Nadiya Hussain’s ghostwriter, who has also written two previous books under her own name. The blurb talking of a man labouring under a deathbed request to build a mosque in an English village, and indeed the cover image, appealed when I was sent details via NetGalley and I immediately requested it. I was not disappointed, and this book will interest anyone who enjoys reading culture clash (or mix!) books and those exploring faith and duty. Bilal and Mariam moved from Birmingham to a quintessentially English village eight years ago and he’s on the parish council while she freelances and writes articles for the local paper. Then “Bill”‘s mum dies, and her dying wish is for him to reconnect to Islam and particularly to build a mosque in the village (she doesn’t ask him to dig a grave in his back garden and give lying in it a whirl, as she did a while back, but he picks up that idea and runs with it). He pushes back against the idea for a bit then has a bit of a religious epiphany, has a chat with the lovely local vicar, and starts to look into what to do. Soon the village is divided, although along strangely fractured lines in places: will the support of the liberal vicar and their neighbour Margaret (in whom, with her over-enthusiasm for learning about other cultures and beam when she manages to greet a Muslim in Arabic, I rather uncomfortably saw myself), be enough to see them through? Will Aunty Khala, with her English learning and salwar kameez stuffed into wellies and Bilal’s best mate Vaseem, with his call-to-prayer app, startle the sleepy village into tolerance or help build more barricades? There’s a lot in here about language and identity – Bilal is “just not myself in Punjabi” but sees Selly Oak through a lens of Muslim life (as I know Selly Oak really well, this was a fascinating passage for me, seeing it through someone’s very different eyes) and Khala and her natural enemy reach a truce in mutual incomprehension. I loved the layers of characters in the village, the visiting Aunties, the touching relationship between Haaris and his great-aunt and Mariam’s pull between self-help videos and her over-religious ex-husband and Bilal’s gentle character. I especially loved the sneaky Goodness Gracious Me reference, which had me hooting out loud with laughter! A great read with a lot of depth but still entertaining and even silly at times (in a good way). Thank you to publisher Bonnier Zaffre for making this book available to me via NetGalley in return for an honest review. This book was read for Reading Ireland Month (read about it at 746 Books here) and in fact came from Cathy at 746 books last year: she reviewed it here and then had a competition to win a copy, which I won! So it seemed only appropriate to read and review this book for this year’s month of Irish literature. I started it before I went on holiday and finished it on my return, even though it’s a slim volume, but I picked up the threads just fine. 50-year-old Sarah Vincent lives in a flat in her old family home, with two old school friends occupying other flats and the daughter of another, a young mum with a flighty husband, in the stable block. One of her contemporaries is a resigned wife, the other the brilliant, fragile and beloved monster, Helen, whose every whim must be attended to. Yes, she has had her tragedies in life, but she’s from a guess not an ask culture and poor Sarah spends a lot of energy guessing what she wants from her, while watching her go through other people’s husbands. Oh, also living in the house are the ghosts of Sarah’s parents, but not of her governess, who still holds on and has to be visited in her nursing home. School pupils of Sarah’s come to special teas or lessons and thoughtlessly trample her smallish life. Sarah is a Good Woman, a devoted, dowdy teacher, visitor of the afflicted, listening ear to her cousin, and never thought of as having her own life or emotions. She’s beautifully drawn and you do root for the worm to turn. 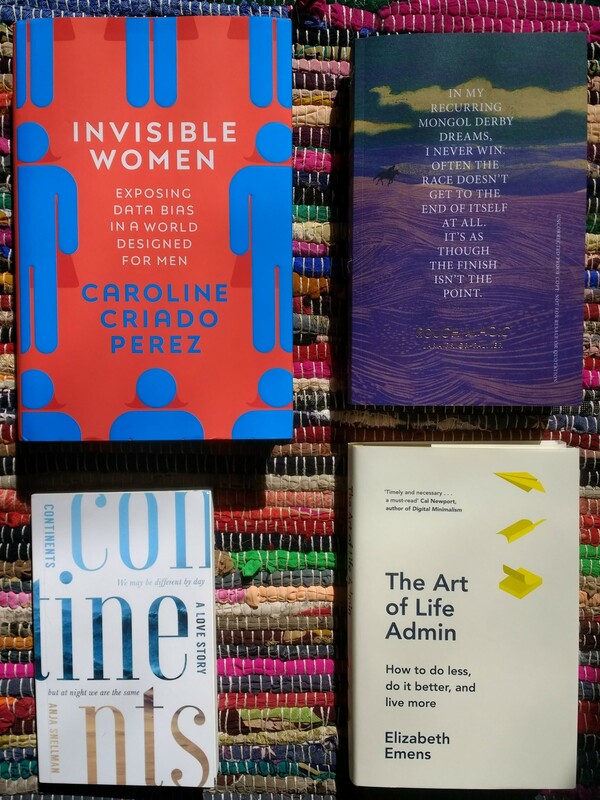 Her life and those of her old friends are skillfully interwoven and described, with the layers you see of the schoolgirl in your old friend, the tiny triumphs and rivalries of ageing, the terrible indignities of trying to buy a decent dress, and the karmic kindnesses returning to you. There’s something of an experimental form in this quiet but not predictable novel, with shifting locations, all presided over by the Irish landscape and narratives from the point of view of other characters every now and again. One character hears a phone ring three times but it’s ringing in three different places for three different people, something that unfolds until you remember that sentence about Addie hearing the rings as she settles into bed – beautifully done. And is that a glimmer of hope at the end? 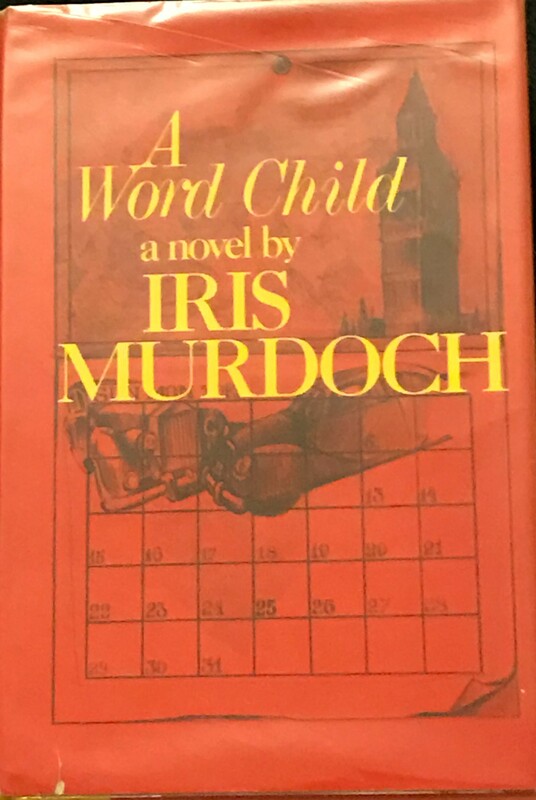 Well it was going to happen, wasn’t it … I’ve found so much more to like in some of my less-favoured Murdoch novels and then, having been looking forward to this one, I was a bit, not disappointed as sucb, but surprised that I remembered such a horrible central character so fondly! 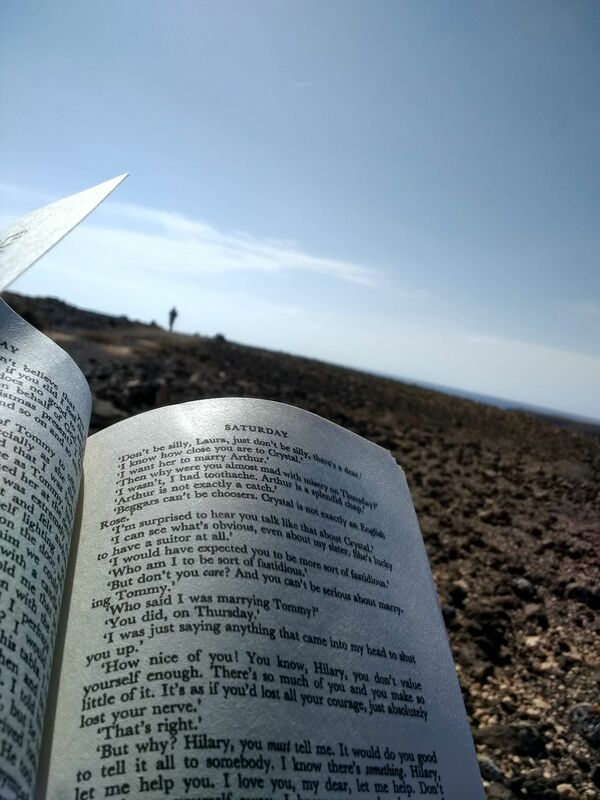 I’ve been away on my hols, hence the rather odd selection of reading matter in the last two reviews, so here you have an image of what I’d call “Extreme Iris Murdoch reading” – sat in the middle of a lava field in Fuerteventura (that’s my husband heading off to look for some birds). If you’re doing the readalong or even selected books along with me Or some time afterwards, do share how you’re getting on and which have been your favourites so far. So I remembered Hilary Burde as a gente, slightly shambliing, slight figure, for no discernible reason at all, rather than a big bruiser who keeps bashing women and frightening them. Why, I’m really not sure, as all the information is given to us in the book. We gradually come to realise Hilary is a man who keeps to a strict routine and regime in order to stave off madness, caused partly by his accidental – or not – killing of his friend Gunnar’s wife, with whom he was having an affair. So he has different days for different friends, keeps everything compartmentalised, hates his office-mates, worships his sister, tolerates her suitor Arthur, and puts up with his fey lodger, Christopher. Then a mysterious woman called Biscuit starts following him around and he finds out through office gossip that Gunnar is back … with a new wife. Tommy owns the crowded room full of knick-knacks that has to exist in every book. Clifford has a more refined version with Indian miniatures and tiny bookcases. Hilary gives Biscuit a black pebble which she later flings back at him. For water, we have the endless rain and dripping umbrellas, and of course the Thames as well as the Serpentine and Boating Lake. There’s no pursuit in the dark or standing in gardens looking through into houses, but Hilary does chase Biscuit down the Bayswater Road. In terms of siblings, we have Hilary and Crystal, but Clifford also had a sister, who died. Hair isn’t such a big theme but Laura has an unsuitably flowing grey mane, Biscuit a long black plait Kitty sophisticated brown layers and Crystal a frizzy fuzz last seen in “Sacred and Profane”. A new theme coming through seems to be the quest, which Hilary talks of on p. 200: “I now had a task. I was like a Knight with a quest. I needed my chastity now; I needed my aloneness”. The feeling of feuds and owing, when Hilary says, “I owe Gunnar a child” reminds me of “The Green Knight” and brings the patterning into sharp relief. There’s one of IM’s horrible prefigurings when Hilary is talking to Kitty on the jetty – “I felt now as if I were plunging around in the mud” (p. 243) and one that could be from “A Severed Head”: “Powers which I had offended were gathering to destroy me” (p. 323). The humour is there, but savage as I said: “Not to have been born is undoubtedly best, but sound sleep is second best” (p. 16) feels like a good example. IM is funny about Christopher’s happenings and has Hilary be hilariously vile about Tommy’s knitting, which she does because he once said he liked it, but makes him want to vomit. In echoes with other books, there’s yet another set of telephone entrails (“The Black Prince” and “A Fairly Honourable Defeat” have them and I’m sure there are more in “The Book and the Brotherhood”). The parks of London of course echo several other books, as does the leap into the Thames at the end. Hilary’s three women demanding babies, echo Edgar’s three women planning to visit at he end of “The Sacred and Profane Love Machine”. What will become of Hilary at the end? Without a set of fake epilogues to contain him, this latest first-person narrator seems to drift away from us in this stranger than I remember book. Is it shocking that Hilary is only 41? Yes, a bit: this is the first time I’ve been older than quite a few of the characters I’ve always known as being older than me, and maybe this has reduced my tolerance. The sense of place, though, is as I remembered, and eminently traceable. I’ve been noticing bits of running in the books and here we have Hilary in the parks, “I ran, and was cleansed of myself. I was a heart pumping, a body moving. I had cleaned a piece of the world of the filth of my consciousness” (p. 26). 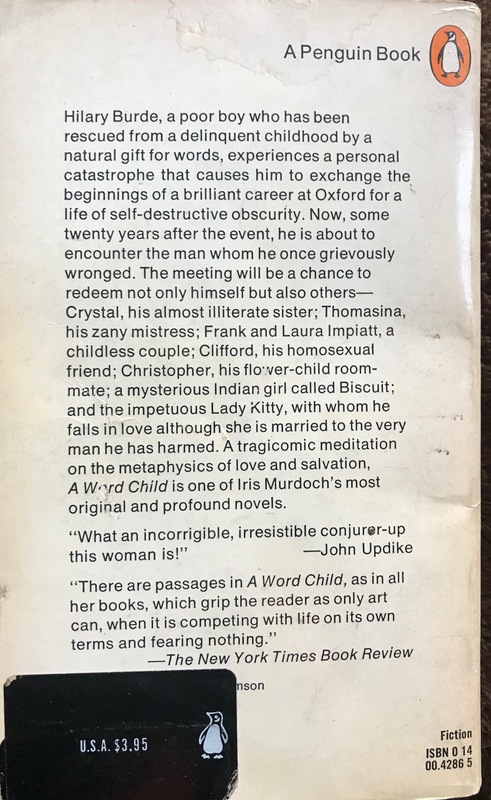 PS I should have added this – this was also read for Reading Ireland Month as IM identified as being of Irish descent and Cathy always lets me include her (read about it at 746 Books here).